25th of April, 2017 – Awingu, a developer of online workspace aggregator software, today announced an alliance with Brazilian IT Distributor TechMag to expand its web-based mobility solution into the Brazilian reseller channel. Awingu’s software provides a secure online workspace that is accessible using any device with an html5 browser. Today’s office environment typically combines SaaS, The Web, Windows Server, Windows Desktop and older legacy applications. Companies are however driven to modernize their workspace to gain productivity and mobility while keeping strong control on security and compliance. With Awingu, any application can run securely inside of a browser without the need to re-program. The setup is quick and the TCO is unmatched in the industry. TechMag is a technological vanguard in security solutions. “We develop tailored solutions with the expectations and needs of the market mind. Awingu fits the picture perfectly. With Awingu we add to our portfolio a solution that is easy-to-use, secure, and, leverages the power of web-based technology”, says Daniela Bulka Gianconi, Managing Director at TechMag. 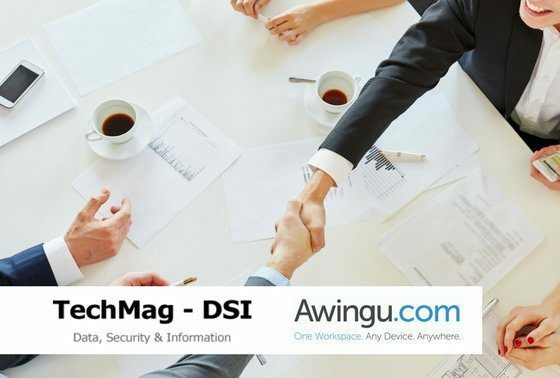 “With its strong track record in security and cloud solutions, TechMag is well placed to create a strong and unique Awingu offer for the Brazilian reseller landscape”, adds Walter Van Uytven, CEO Awingu. Awingu develops software to simplify enterprise mobility and liberate legacy applications. Our software aggregates all company files and applications to one secure online workspace that can be accessed from any device or OS using any HTML5-based browser. Awingu mobilizes all company applications without disrupting how you run your IT and works with any cloud services. No agent is required on personal or corporate devices, and collaboration and file sharing are as simple as sending an URL. IT assets remain centrally secure and no data footprint is ever left behind for a safe way to implement BYOD. Awingu is the fastest and easiest way to empower a mobile workforce. Awingu is headquartered in Ghent, Belgium with affiliate offices in San Francisco and New York. Committed to product excellence, next generation technology and development of innovative products, Techmag develops, distributes and commercialize equipment and solutions to add security and mobility true easy deployment for any company/vertical. Starting with data capture to identify user (magnetic and biometric readers), multi-factor authentication, and backup and surveillance solutions, we can overall security in any step to customers. Located in São Paulo, Brasil, with resellers all over Brasil. Visit us at www.techmag.com.br.